Fifty years ago in 1964, John Bell , showed that deterministic local hidden-variables theories are incompatible with quantum mechanics for idealized systems. Inspired by his paper, Clauser, Horne, Shimony and Holt (CHSH)  in 1969 provided the first experimentally testable Bell Inequality and proposed an experiment to test it. That experiment was first performed in 1972 by Freedman and Clauser . In 1974 Clauser and Horne (CH)  first showed that all physical theories consistent with “Local Realism” are constrained by an experimentally testable loophole-free Bell Inequality—the CH inequality. These theories were further clarified in 1976–1977 in “An Exchange on Local Beables”, a series of papers by Bell, Shimony, Horne, and Clauser  and by Clauser and Shimony (CS)  in their 1978 review article. In 2013, nearly fifty years after Bell’s original 1964 paper , two groups, Giustina et al. and Christensen et al. have finally tested the loophole-free CH inequality. Clauser and Shimony (CS)  also showed that the CHSH inequality is testable in a loophole-free manner by using a “heralded” source. It was first tested this way by Rowe et al. in 2001, and more convincingly in 2008 by Matsukevich et al. . To violate a Bell Inequality and thereby to disprove Local Realism, one must experimentally examine a two component entangled-state system, in a configuration that is analogous to a Gedankenexperiment first proposed by Bohm  in 1951. To be used, the configuration must generate a normalized coincidence rate with a large amplitude sinusoidal dependence upon adjustable apparatus settings. Proper normalization of this amplitude is critical for the avoidance of counterexamples and loopholes that can possibly invalidate the test. The earliest tests used the CHSH inequality without source heralding. The first method for normalizing coincidence rates without heralding was proposed by CHSH  in 1969. It consists of an experimental protocol in which coincidence rates measured with polarizers removed are used to normalize coincidence rates measured with polarizers inserted. Very high transmission polarizers are required when using this method. Highly reasonable and very weak supplementary assumptions by CHSH and by CH allow this protocol to work in a nearly loophole free manner. A second method for normalizing coincidence rates was offered by Garuccio and Rapisarda  in 1981. As will be discussed below, it allows experiments to be done more easily, but at a significant cost to the generality of their results. It was first used in the experiment by Aspect, Grangier, and Roge  in 1982. It uses “ternary-result” apparatuses and allows the use of highly absorbing polarizers, which would not work with other normalization methods. It normalizes using a sum of coincidence rates. Gerhardt et al. in 2011 theoretically and experimentally demonstrated counterexamples for tests that use this normalization method. Their experiments thus obviate the validity of their counterexamples, and further indicate that very high transmission polarizers are necessary for convincing tests to be performed. 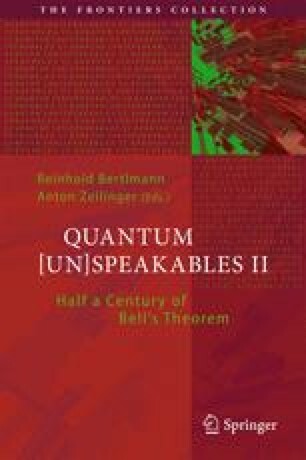 A talk presented at Quantum [Un] Speakables II, 50 Years of Bell’s Theorem 19−22 June 2014, University of Vienna & Austrian Academy of Sciences. Local Realism was first explicitly defined by Clauser and Horne (CH)  in 1974, and further clarified in a series of papers by Bell et al. in 1976–1977 and by Clauser and Shimony  in 1978. CH originally called the theories governed by it, “Objective Local Theories”. Clauser and Shimony renamed these theories “Local Realism”. Local Realism is the combination of the philosophy of realism with the principle of locality. The locality principle is based on special relativity. It asserts that nature does not allow the propagation of information faster than light to thereby influence the results of experiments. Without locality, one must contend with paradoxical causal loops, as are now popular in science fiction thrillers involving time travel. Upholding locality is effectively a denial of the reality of causal loops. Equivalently, it is the assertion that history is single valued. Realism is a philosophical view, according to which external reality is assumed to exist and have definite properties, whether or not they are observed by someone. Bell’s Theorem, and the experimental predictions made by the associated CHSH and CH Bell’s Inequalities, along with the associated experimental tests of these predictions, show that any theory that combines Realism and locality, must be in observed disagreement with these experiments. Consequently, it can now be asserted with reasonable confidence that either the thesis of Realism or that of locality (or perhaps even both) must be abandoned. Another way of describing what we mean by Realism here is to say that it specifies that nature consists of “objects”, i.e. stuff with “objective reality”. Realism assumes that objects exist and have inherent properties on their own. It does not require that these properties fully determine the results of an experiment locally performed on said object. Instead, in a possibly non-deterministic world, it simply allows the properties of an object to influence the probabilities of experiments being performed on it. There is also nothing in our specification that prohibits an act of observation or measurement of an object from influencing, perturbing and/or even destroying said properties of the object. Realism thus assumes that an object’s properties determine minimally the probabilities of the results of experiments locally performed on it. Realism, under the additional constraint of locality, i.e. Local Realism, then assumes that the results of said experiments do not depend on other actions performed far away by someone else, especially when those actions are performed outside of the light-cone of the local experiment. Properties, as referred to here, are what John Bell called Beables, and what Einstein et al. called “elements of reality”. The properties of an object constitute a description of the stuff that is “really there” in nature, independently of our observation of it. When we perform a “measurement” of these properties, we don’t really need to know what we are actually doing, or what we are really measuring. What we are assuming is that what is “really there” somehow influences what we observe, even if said influence is inherently stochastic and/or perhaps irreproducible from one measurement to the next. Recall that Einstein et al. attempted to define an object’s properties as something that one can measure, but they further required that the measurement result be predictable with certainty. However, given Ben Franklin’s observation that the only predictions that are certain in life are for death and taxes (see the section “Bell’s 1964 E-Inequality for Idealized Binary Result Apparatuses”), said definition becomes meaningless, because it describes nothing that can ever occur in reality, (unless, of course, said properties are equivalent to death and taxes). Our definition is very much looser and requires no predictions with certainty. Precisely how does one define an object with such extreme generality? For the purposes of Local Realism and its tests via Bell’s Theorem, a purely operational definition of an object suffices. An object (or collection of objects) is stuff with properties that one can put inside a box, wherein one can then perform measurements inside said box and get results whose values are presumably influenced by the object’s properties. What then is a box? A box is defined as a closed three-dimensional Gaussian surface,3 inside of which one can perform said measurements of said properties. For Local Realism, such a box becomes a four-dimensional Gaussian surface consisting of the backward light cone (extending to t = −∞) enveloping a three dimensional box, that contains the object(s) being measured, at the time that they are being measured. Familiar examples of “classical” objects that can be put into boxes are galaxies, stars, airplanes, shoes, trapped clouds of atoms, single trapped atoms, electrons, y-polarized photons, a single bit of information, etc. All of these can be put into a box and have their properties (e.g. color, mass, charge, etc.) measured. Or can they? Via Bell’s Theorem experiments, one may ask—are there examples of objects that cannot be put inside such boxes?4 If so, such objects cannot be described by Local Realism. Furthermore, if there are parts of nature that cannot be described by Local Realism, then Local Realism must be discarded as a description of all of nature. Sadly, (for Local Realism advocates5) the individual particles comprising a quantum-mechanically entangled pair of particles are parts of nature that cannot be described by Local Realism. Figure 28.4 shows the worst-case set of required elements for a fully loophole-free Bell’s Inequality experimental test. Two objects and associated binary-result apparatuses are each contained in associated boxes that are space-like separated at the time of the measurement events. The apparatuses measure quantum-mechanically entangled pairs of particles. The boxes are labeled ΣA. and ΣB in the Figure. Each box contains a signal recorder and signal source. Each signal source generates via the free-will of an observer an appropriate apparatus parameter setting. The two settings are respectively called a and b. Each box contains a clock that permits synchronized measurements in the two boxes of the object pairs, that were emitted in the past and that have propagated into these boxes at subliminal speed for measurement by the apparatuses. Worst-case set of required elements for a Bell’s Inequality experiment. This figure was first presented by the author at the 1976 International “Ettore Majoranna” Conference in Erice, Sicily on “Experimental Quantum Mechanics”. The conference was organized by John Bell, Bernard d’Espagnat, and Antonino Zichichi. With present-day jargon, the characters labeled “Signal source and recorder” might now be named Alice and Bob. An important issue discussed in “An Exchange on Local Beables”, (Bell, Shimony, Horne, and Clauser ), is that the apparatus parameters a and b must be generated independently, for example by the presumed free will of the observers, and are not to be counted as part of the objective reality being measured. The probability of obtaining the measured result A in box ΣA may depend on all of the stuff (objects) that are inside the box at the time of the measurement, including any stuff that may have propagated into the box at a velocity less than or equal to the speed of light since the beginning of time. The probability of obtaining the measured result A in box ΣA may depend on the freely chosen apparatus parameter a. Locality, however, prohibits the probability of obtaining the measured result A in box ΣA from depending on the apparatus parameter b that was freely chosen in the space-like separated box ΣB. Locality, similarly, prohibits the probability of obtaining the measured result A in box ΣA from depending on the result B, as measured in box ΣB, which, of course, is allowed to depend on the parameter b. Similar reciprocal permissions and prohibitions like (1)−(4) govern the probability of obtaining the measured result B in box ΣB. Surprisingly, that’s all you need to derive the CH (and CHSH) inequality and thereby to constrain and test Local Realism!